“A journey is like marriage. The certain way to be wrong is to think you can control it.” John Steinbeck. I love lighthouses. I am completely fascinated by them. So much so that I visit as many of them as I can when I travel, I write blogs about them, AND I got married at one last summer! 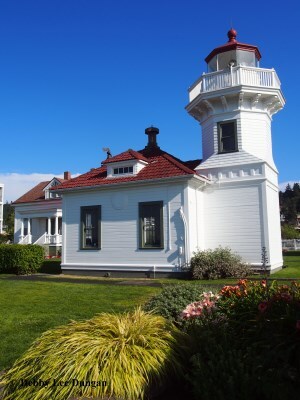 The Mukilteo Lighthouse was the location of our grand event. Located about 30 minutes north of Seattle, Washington, next to the ferry landing in Mukilteo, our wedding day was warm and sunny, with a slight breeze. With the background of not only the lighthouse, but also the ferries, the waters of Puget Sound, and Whidbey Island beyond, it was perfect. Even when a ferry blew its horn right in the middle of my husband’s niece singing “Love Me Tender,” it just made our wedding that much more fun. 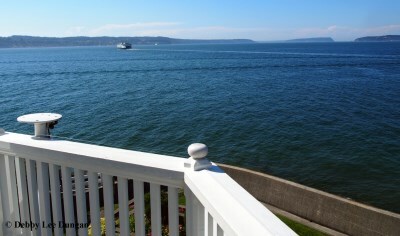 Our wedding at Mukilteo Lighthouse was perfect. 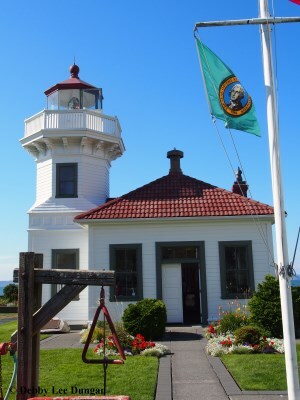 Mukilteo Lighthouse is located in Mukilteo State Park. “Native American Indians [the Snohomish] originally used the land in this area as a site for a camp during the winter months. 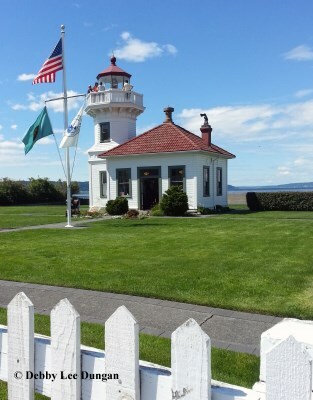 In fact, Mukilteo is a local Indian word for ‘good place for camping.’” Next to the lighthouse, there are two keepers’ houses, a small museum with exhibits, photographs and information, and a gift shop. In the park there is a beach, picnic grounds, a playground, and a boat launch. 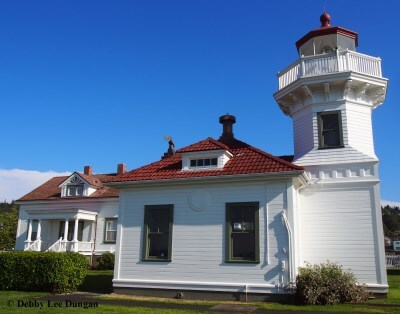 When the Mukilteo Lighthouse began allowing weddings, “according to volunteers, not one of the first hundred performed at the lighthouse was rained on. There was rain before or after, but never on the actual ceremony.” Now I don’t know what number wedding we were, and how many weddings have been rained on after that first hundred, but we did not have a single drop! And when our ceremony was over, our guests got to go into the lighthouse to climb the 36 stairs of the 38-foot tall tower, for not only a tour, but also to see the beautiful views. 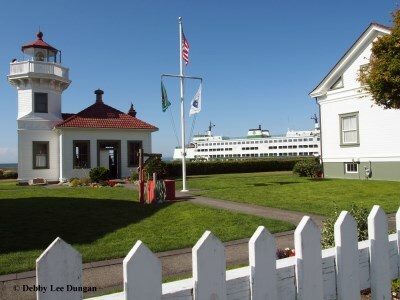 I also designed our Thank You cards to include a picture of the Mukilteo Lighthouse.